I, for one, love a great lace dress. Which is good news since it seems lace is definitely on trend for spring. I would argue that a little lace dress is much more versatile than you might think. Dress it down with the perfect denim jacket or up with a great pair of heels or wedges. You can't go wrong with a gorgeous lace dress in your wardrobe. I have had a version of this Madewell lace dress (seen here) for years and it's perfect for travel since it's so versatile. I have already added this gorgeous off-white lace dress to my wardrobe and I have my eye on adding another - either paired with a pattern like this one or in a bold color like this one. 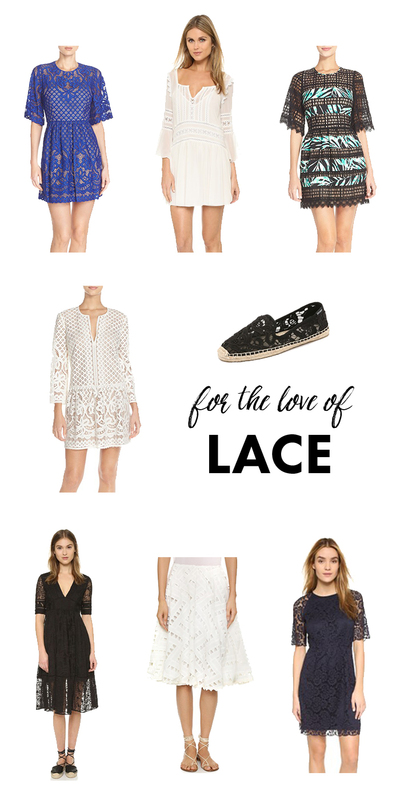 You can shop all of my favorite lace picks for spring below!